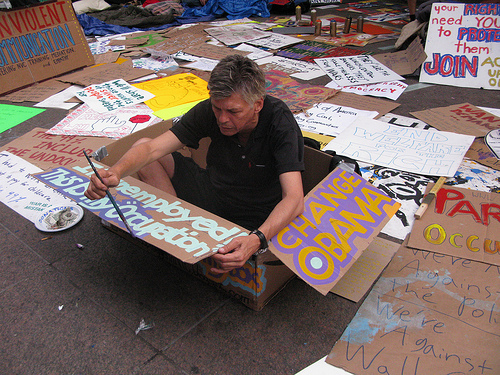 Carlson, 55, has been living in a midtown homeless shelter, but has made daily treks to Zuccoti Park, painting signs and protesting what he believes are the issues that led to his unemployment. 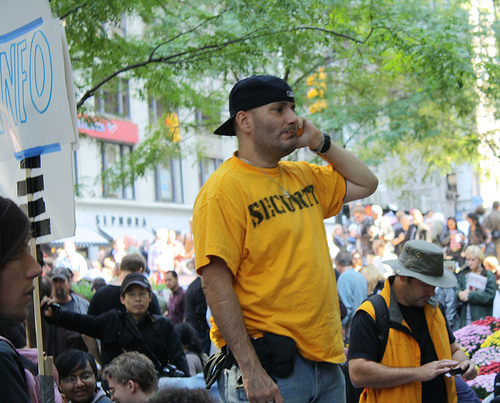 A former advertising executive, he has been unemployed for about a year and is an example of the frustration that many of the protestors say they feel. Carlson said the preoccupation of the government was with war and bailing banks out, not with helping Americans. Carlson drew a pie chart on paper and shaded a portion to illustrate his point. “This is the military spending in the world and America occupies 45 percent of it,” he said. With thousands of people holding signs and chanting slogans, Carlson sat among dozens of posters and said he finds peace in painting slogans he comes up with himself. He takes his time with each one. Carlson learned sign painting in college to make money. He uses that skill now to help the movement, he said. In 1979 he graduated from Southern Illinois University where he majored in corporate communications and minored in journalism. Later, he worked in the advertising industry and in 1995 was transferred to Korea by the agency he worked for. The company did not do well, so in 1997 he returned and opened his own international advertising agency in New York. Carlson said when President George Bush coined the term “axis of evil” his American clients did not want to invest in Korea and Korean clients did not want to invest in America, which killed his business. He said the economy has been bad ever since. Carlson is divorced and he has no children. He does have an 82-year-old father and two younger sisters, but they would not understand his plight. “This whole situation is above my family’s heads,” he said. 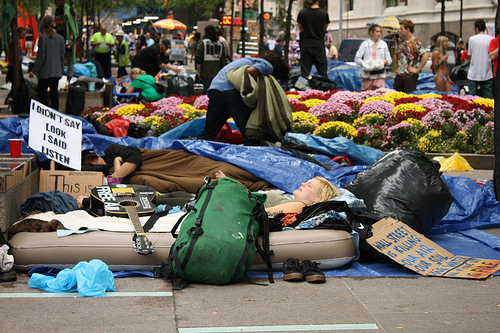 Carlson carries his laptop everywhere and blogs his journey as a homeless man. He still looks for a job every day. Hey folks 🙂 I am sharing the No Box Blogs Project with all those I can find in the homeless services communities. The concept is very simple; the project provides free blogs, emails, training, support and more to homeless individuals around the world. This isn’t a non-profit, this isn’t run by a corporation, this was conceived by myself, Mooch, while living in my car in Los Angeles, CA. Please visit http://noboxblogs.com and spread the word, or ask me anything you like to better understand how the simple tool such as a blog, can literally change and even save a life. I appreciate your article, and your blog, thanks! 1) My agency was not in NY but in Seoul, South Korea. When G.W.Bush coined the term “Axis of Evil” in reference to Iran, Iraq and North Korea, business from America dried up in South Korea because all people heard was ‘Korea’ (and Americans are generally not good at world geography). Business from South Korea dried up because Korean clients thought American’s didn’t like them or their products. All clients instituted six month spending freezes and six months without billings took us out. 2) We did not go bankrupt. I simply closed it, all bills and taxes paid. 3)I do not use the box as a shelter. It is only a prop. 4) I am unemployed because I only returned to the US (from 16 years in Asia) about six weeks ago and am looking for work. 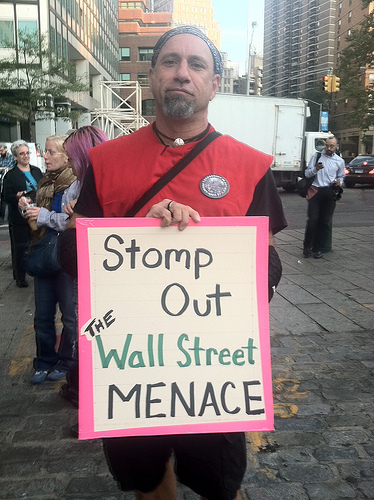 Thanks for personifying a small part of the OWS movement. Hopefully, that’s what it’s all about.